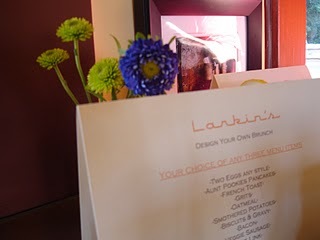 After tons of delays, Larkin’s in Eagle Rock finally opened about a month ago. I’d been on their email list for awhile and had known about their private tasting dinners, but never got a chance to go. I’d pass by the restaurant almost daily (it’s really close to our house) and make a mental note to myself to try it out once it actually opened. Fast forward to last weekend when, as with almost every Sunday, we started driving toward the Coffee Table and (as usual) passed Larkin’s. When I mentioned to J that it was finally open, he quickly turned the car around and proclaimed that we should try it out. Quite the break in tradition, I must say- you see, the Coffee Table is practically a religion for us on weekends. 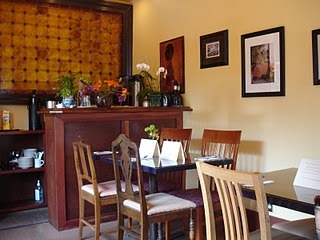 The food is well prepared, the coffee is kickin’ and you can tweak any dish as many ways as you can possibly imagine. May I get the Eggs from Hell, easy “hell,” egg whites only, wheat toast instead of potatoes and easy on the cheese? The CT counter girl doesn’t even blink an eye, and within 10 minutes, your breakfast arrives, perfectly tweaked to your liking. When you get consistency like that, it’s hard to go anywhere else, but the cute craftsman house that is Larkin’s beckoned with it’s shiny windows so we pulled into the parking lot. After walking in and being seated immediately, I took a good look at the space….and I was already in love. The mix-and-match vintage tables and chairs, the row of bright, clear light bulbs that lined the hallway, large windows overlooking a flower-filled yard….I felt like I was in my Southern grandmother’s house……that is, if I had a southern granny. Even though my personal taste in interiors leans more towards minimal, slightly Asian decor, I was just enamored of the homey, vintage feel of the place. We quickly ordered coffee and checked out the menu. I realized that the menu was actually a list of about ten items, and you were instructed to choose three to create your own brunch. There was also a mission statement of sorts- basically saying that the chef makes dishes based on family recipes so they don’t really do substitutions or additions………so, in a nutshell, no tweaking. Although I was tempted to order my scrambled eggs with egg whites only, I quickly digressed……….I mean, after all, Larkin’s is a SOUL FOOD JOINT and if I wanted egg whites, what the hell was I doing there? Of course the “I’m the paying customer” part of me was conflicted with the culinary adventurer in me, but I decided to simply follow the instructions and pick three things off the menu. 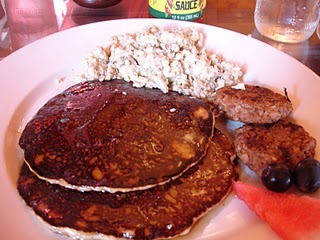 J and I both ended up with scrambled eggs, pancakes and veggie sausage. We sipped our super hot coffee and waited. The food came quickly and smelled divine. We dug in- the scrambled eggs were seasoned with herbs and spices and didn’t need a bit of additional salt or pepper- they were perfect and original. The pancakes came already dressed with syrup- just the right amount, I might add- and were crisp and dark brown on the outside, slightly chewy and toothsome on the inside. Delicious and clearly created from a special recipe. The house made veggie sausage patties were spicy, and although I felt they were a bit on the salty side, J loved them and ended up eating one of mine. Since there were no prices on the menu, I had no idea of the cost until we got the bill……..each item was $5. So, if you’re required to choose three items for brunch, your meal will be $15.00……sort of steep for pancakes and sausage, no? I can’t be 100% certain that you HAVE to choose three items, but after reading the “it’s our way coz we know it’s the best” mission statement, I can only assume that you must. The thing is, most of the menu items are, well…….on the heavy side- i.e. smothered potatoes, hot links, French toast, grits…..so it’s a bit difficult to create a balanced plate. But then again, “This is a SOUL FOOD JOINT!” I had to keep reminding myself. To be perfectly honest, I would normally have a problem with being told how many items I should order, or that I couldn’t substitute this for that, but I don’t at Larkin’s. Why? Because the food is GOOD. I’ll go as far to call it SPECIAL. Those pancakes must have been made in a cast iron skillet that probably has years of flavor on it, the eggs were cooked to perfection and seasoned oh-so-well, and although the veggie sausages weren’t my absolute favorite, you could tell they were made by hand, made with care and made by someone who really knows how to cook. So who am I to argue with these people whose love of food actually comes through in their offerings? I’m sure a lot of people would disagree and say that, as a paying customer, the customer has the right to choose however they want their food, but I’d have to argue that you might be missing out on some damn good food! Sure, I tweak my eggs at the Coffee Table, but those are just eggs. They aren’t made by your southern granny, ya know? 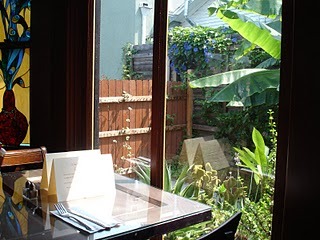 This entry was posted in brunch, Eagle Rock restaurants, Larkin's. Bookmark the permalink. I am big on ordering food the way the chef wants to make it. I figure, they should know what they are talking about, and if they don’t…well, I always have my blog to run to and complain on, right?? I am into the culinary adventures, so I am not too afraid to let chefs do their worst. The only thing that I wouldn’t like is feeling like I have to order three items. For one thing, I wouldn’t be able to finish my breakfast, and for another, $15 is pretty steep. I don’t mind paying $5 per item, but I would want to feel I can order as many or as few items as I am hungry for. But, like you said, it’s SOUL FOOD! Their food looks great, but I agree with you that it is a little steep for breakfast. And I don’t like the practice of not putting prices on the menu. They’re sure to make some people mad when their check arrives. awesome! thanks for sharing. 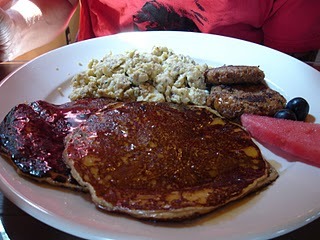 i’m always looking for great breakfast joints near in my area (SGV). i’ll have to try both Coffee table and Larkin’s.